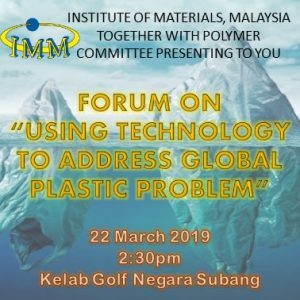 Forum no.5 will present the progress report of Phase 3 (2018-2020) which include the study of FTIR analysis on more coating products such as Inorganic Zinc Coating, Epoxy-Zinc Coating, High Solids Epoxy Coating, Polyurethane Coating, Glass Flake Polyester Coating and Silicone-Aluminium Coating plus comparison of aged (1-2 years old) products. Phase 1 (2013-2014) initiated the application of Fourier-Transform InfraRed (FTIR) Spectroscopy as a simple and reliable tool for the study of reproducibility (i.e. to fingerprint) of the epoxy coatings (Resin and Hardener). The fingerprinting regions of FTIR for epoxy resin and hardener were identified and the confidence level of acceptance for QA & QC control was proposed at ≥ 90.0%. These were presented in Forums 1 & 2. 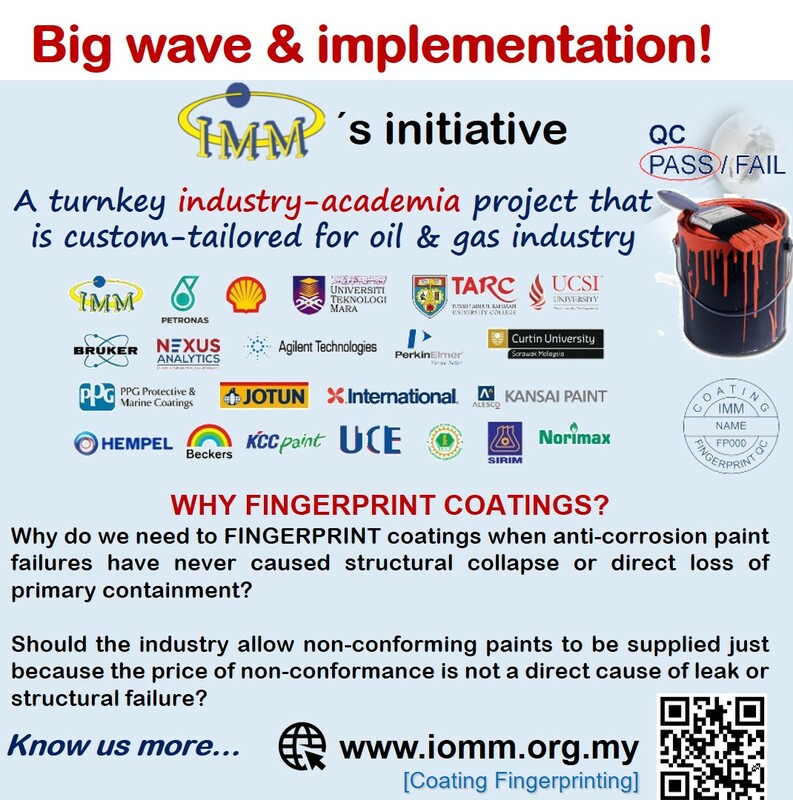 Phase 2 (2015-2016) involved the appreciation of the root causes of coating failures throughout the world and the adoption of the Coating Fingerprinting initiative by the Malaysian Oil & Gas Operators as one useful QA/QC tool for ensuring coating quality. It also led to the establishment of the 1-day Foundation Course on Coating Fingerprinting and the 2-day Certification Course for Coating Fingerprint Quality Controller. These were presented in Forums 3 & 4. 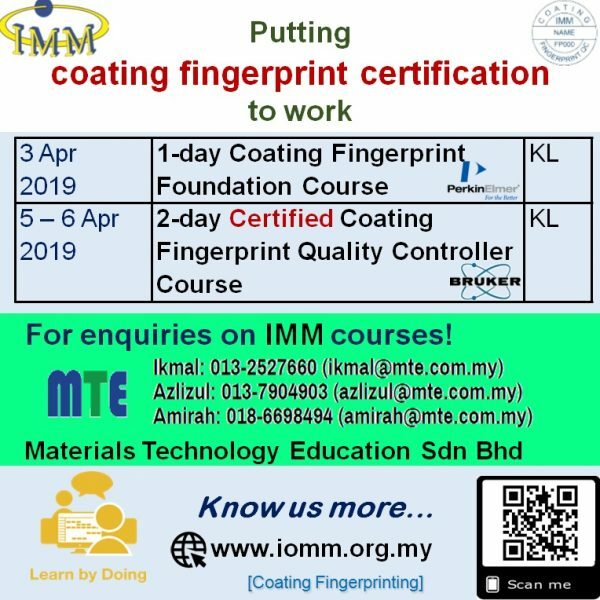 IMM Coating Fingerprinting: Find out more in this coming April 2019! Can polymeric products have a MILL CERTIFICATE like metals? Are QUALITY and SAFETY not a major concern in our industry and our daily lives? Do we need a catastrophe or fatality to occur before someone says “we should have foreseen this could happen”? 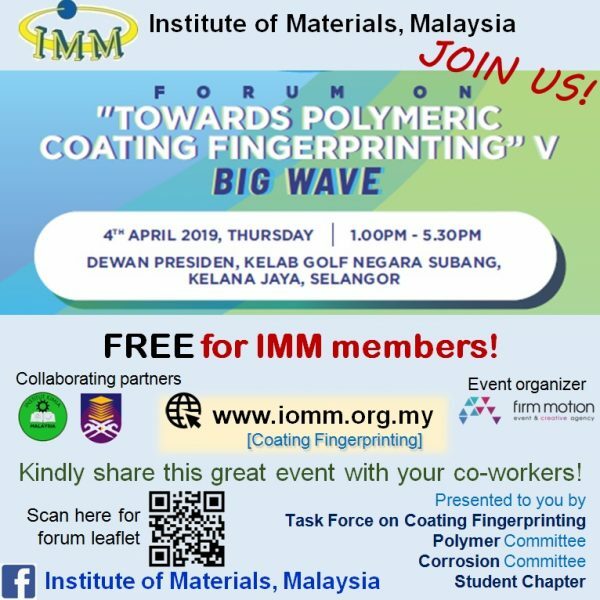 If you want to know more, come and join us in the Forum on “Towards Fingerprinting of Polymeric Coatings” V Big Wave on Thursday, 4th April 2019 at Kelab Golf Negara Subang, Selangor. Register your participation with us online, click here! Further details and information on the Coating Fingerprint Certificate and the First-in-the-world IMM Standard on Coating Fingerprinting Overall Procedures for Paint Systems using FTIR and other related methods will be shared in this forum! Are you considering to upgrade to become a IMM Certified Coating Fingerprint Quality Controller? 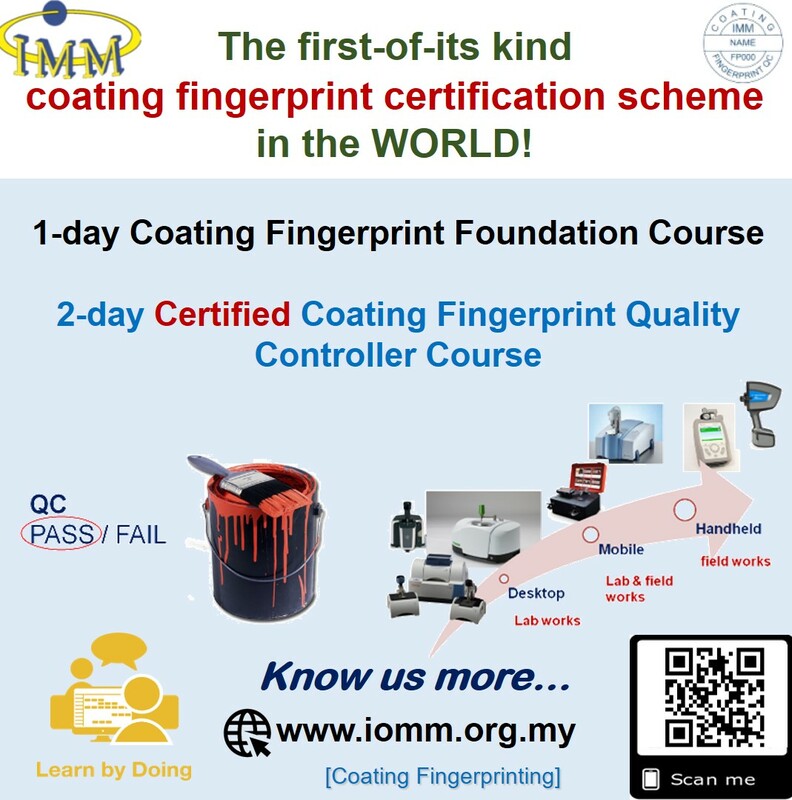 Click here to know more on the IMM Coating Fingerprint Certification Scheme! 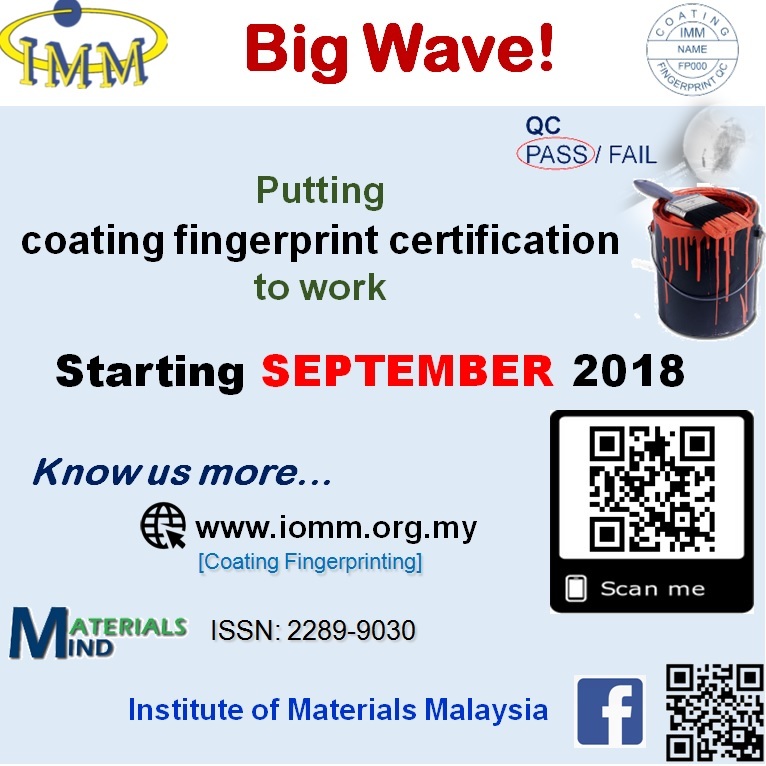 If you are the participant of Forum on “Towards Fingerprinting of Polymeric Coatings” V BIG WAVE, you will be eligible to take the 2-day IMM Certified Coating Fingerprint Quality Controller Course without the Foundation course. Is your lab up to be listed as IMM recommended 3rd-party labs to fingerprint coatings? Check out more on the general requirements!